The following list of drugs would have been carried in a Civil War medical wagon per the Medical Department regulations and Appendix A of the Supply list. 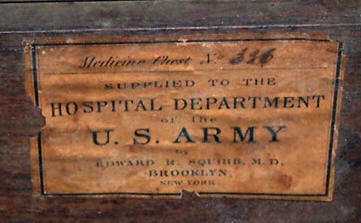 See the 1861 Revised Army Supply Table list of drugs for field and hospital, which is in Latin, as are the labels for the various containers. solution of persulphate of iron.